Wow your family and friends with these easy Strawberry Margarita Jello Shots. They look and taste great and we have a video tutorial to show you how. Check out the details now. With the holiday season always around the corner, our eyes are continually searching out easy and unique ways that you can take your entertaining next level. Adult treats are always popular and today we are sharing these easy and delicious Strawberry Margarita Jello Shots with you. To say you’ll love them is an understatement. 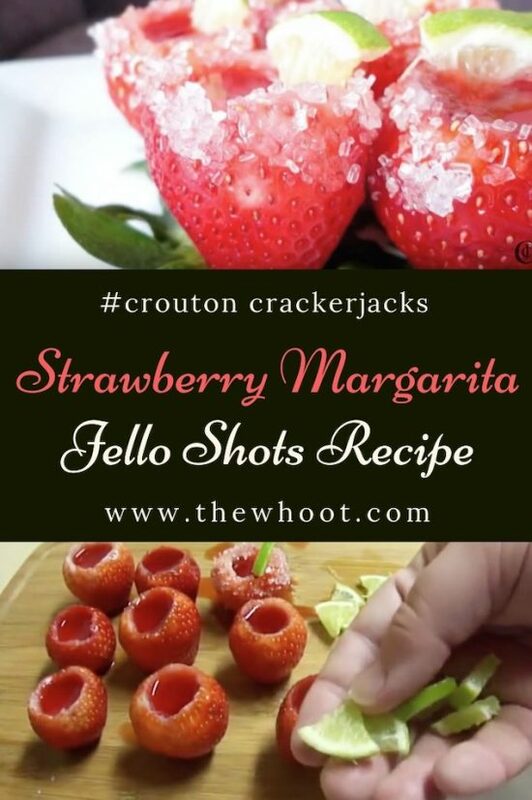 Popular Youtuber, Croutons Crackerjack has created a video tutorial to show us how to create these easy and delicious Strawberry Margarita Jello Shots, and you will love the results. Start off by preparing your strawberries. Rinse and dry them. Remove the top and using a paring knife, core the top. Using a melon baller or small spoon, core out the center being sure not to go too deep. Slice off the very bottom tip of the strawberry to allow it to sit upright on its own. Don’t take off too much or you’ll have a hole in the bottom and your Jell-O will leak out. Place your strawberries onto a cutting board, cookie sheet or plate that will fit into your refrigerator and set aside. In a saucepan, bring 1 cup of water to a boil. Remove from heat and whisk in Jell-O powder until dissolved. Add in 1 cup of well-chilled tequila (or rum for daiquiri shots). Let sit for a few minutes to allow it to thicken slightly. Transfer to a measuring cup and carefully pour the Jell-O mixture into each strawberry. Put into the refrigerator to set up completely (2-4 hours preferably). Meanwhile, slice the lime or limes into thin slices and then into wedges. When Jell-O has set up completely, dip the very top of the strawberry into a small bowl of water. 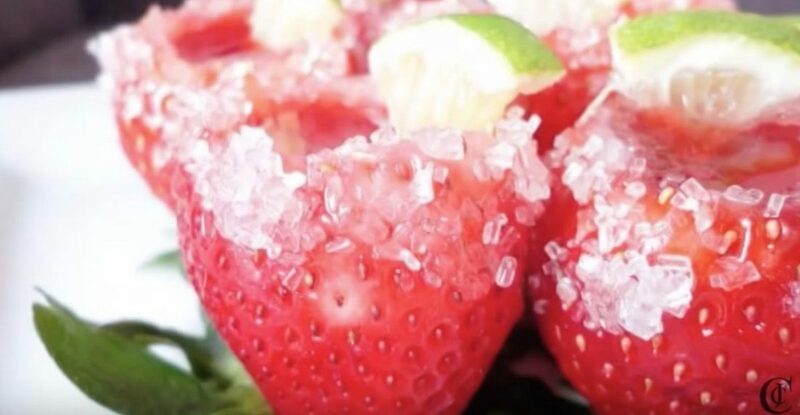 Roll the very top rim of the strawberries into the crystal sugar or salt and place a small lime wedge into the Jell-O. Continue with the remaining strawberries and store in the refrigerator until just before serving. 1 box of Jell-O will fill approximately 4 pints or 48 strawberries. Enjoy! Be sure to give a Like to Crouton Crackerjacks video and please show your appreciation by subscribing to his channel here.